A legend amongst locals, The Hungry Man is a Jersey institution. Perched on the back of Rozel Pier, on Jersey’s east coast, The Hungry Man is big on flavour, friendliness and location. Visitors are treated to some of the best views from Jersey whilst enjoying Rozel’s small harbour atmosphere and enjoying some of the island’s most down-to-earth and honest food. Away from the burgers and hot food, many regulars come here to relax a hot chocolate – a mammoth task in itself – or simply a cup of coffee and a slice of granny cake (yes, made with real grannies!) Simply drive down to Rozel Harbour, pick a parking spot and a table on the pier, and wander up to The Hungry Man’s window to place your order. Sit back, take in the scene, and enjoy one of the best places to eat fast , but fresh, food. A word of warning, sunny days and weekend are very, very busy! Park up at White Rock and enjoy a 20 minute walk down the hill, perfect for working up your appetite! 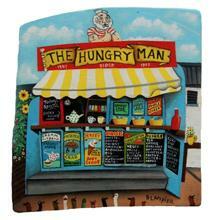 The Hungry Man artworks are painted by Jersey artist Edward Blampied. This entry was posted in Jersey Restaurants and tagged Rozel Harbour, The Hungry Man. Bookmark the permalink.